Sunny back deck is great for your morning coffee and Happy Hour! 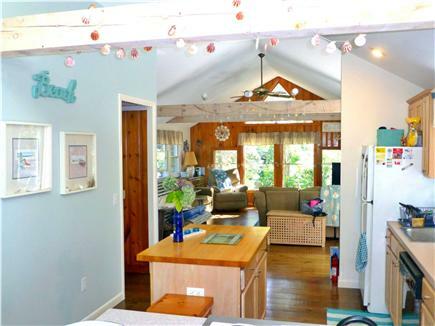 This open, sun-filled beach home will make for a perfect vacation, but being so close to Cape Cod Bay is what you’ll remember! Sand bars, gentle waves and incredible sunsets are only a short walk down the street. 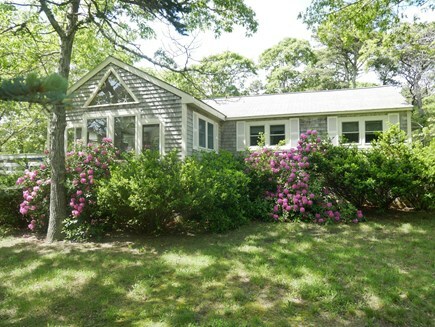 Choose between Pepper Beach, a private association beach or Cooks Brook Beach (you are just 6 houses back from the water!) Large enough for family fun, but also works for couples or girl's getaway trips! The cathedral ceilinged living room, kitchen and dining room gives a spacious feeling to all your activities. A bonus reading nook at the end of the dining room gives adults a place away from the TV. 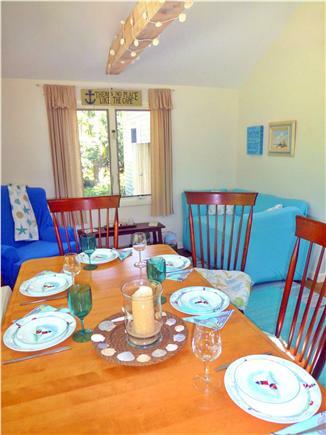 The large dining table and bench seating is great for large dinners or playing games. Have your morning coffee (or cocktails after the beach!) on the large, wrap-around deck. The deck is the perfect place to unwind with a gas BBQ, lounge chairs and an outdoor eating area. Or try out the hammock in the front yard with a good book and listen to the waves. The Master bedroom has a king sized bed; the front bedroom off the living room has a queen size and charming lighthouse theme. Another bedroom has a fun flipflop theme. 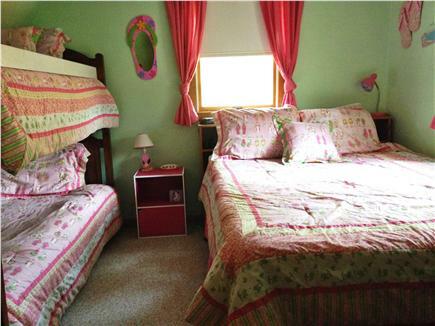 This room is perfect for kids or a family unit with its queen bed and twin bunk beds. 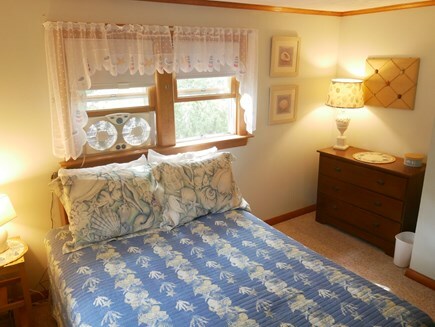 Each bedroom has a window fan available. The blue shell room has a full bed. 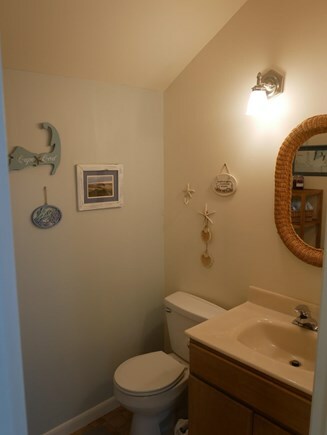 A full bath with shower/tub combo and 1/2 bath off the kitchen gives flexibility for groups. There is also a lovely outdoor shower off the back deck. Vacationers will need to bring their own sheets and towels. A Washer/Dryer is located downstairs. A perfect beach location, but still close to all the other attractions of the Cape. 5 minutes to Welfleet Drive-In and Flea Market! Mini golf and ocean beaches 10 minutes away. Central to both Provincetown and Chatham. Additional pricing info: Lodging tax of 12.45%; $500 security deposit; $150 cleaning fee;$50 discount for multiple weeks, State and local taxes of 12.45% will apply. 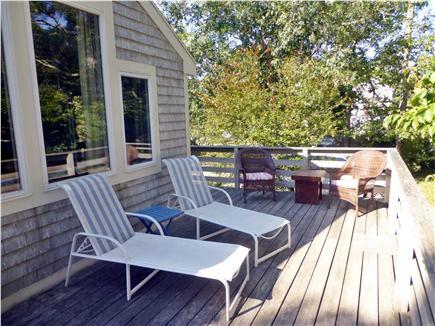 Great house with easy beach access, nice living room and decks. Kitchen works nicely. Would rent again. I rented this home for my two adult sons and their families -- four adults and three children. They were very pleased with their stay. Excellent location to the beach. Easy walk with kids. The main house was so spacious, plenty of space so that the kids could be separated from parents but still in view. Great deck space. The rental was very well equipped. Bedrooms accommodated them very well and great to have the outdoor shower. Would definitely recommend to others. The house was very welcoming, plenty of room for an active family. 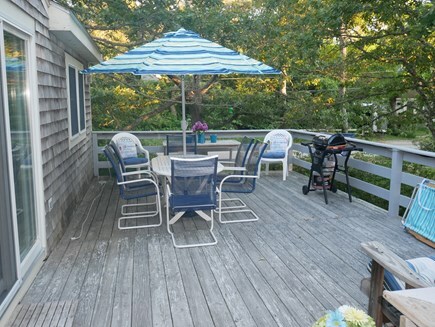 It is in walking distance to a great beach. We had a wonderful week and look forward to returning next year. Thank you for sharing your home with us! I'm so happy you enjoyed the house and are planning to return next year! Cooks Brook Beach is such a fun place to play with grandchidren and enjoy spectacular sunsets. My family and I thoroughly enjoyed our stay! The home is spacious, comfortable and has great amenities. The deck was my favorite part! Perfect for coffee, dinner and cocktails. The proximity to the beach is exactly what we were looking for, an easy stroll. We hope to return next summer! Thank you, Lisa! Coming from someone in the real estate Industry, we consider that to be a big vote of confidence! We're so glad you enjoyed your stay and that you had a chance to enjoy some of the finer things that the house and the location offer. We look forward to hearing from you again next year! Beautiful, modern house with lots of comfortable space to relax and enjoy your Cape vacation indoors and out. Just steps to the beach! Bedrooms have lots of space and a king bed in the master BR. 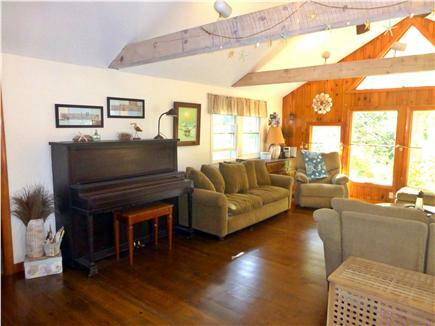 Living room and kitchen nicely designed and a front porch, yard and hammock that will make your stay relaxing. No AC, but cool nights and window fans made for very pleasant temps for sleeping. I'm so happy to hear you enjoyed the house and had a great vacation. It's always fun to hear what things you liked. The porch or hammock are favorites of mine too! Thanks again for your kind words. I hope you come back soon! The home is the perfect place to to spend your summer vacation, it's a low traffic area for kids to play outside, and the beach is SOOO close, that all you need is a towel. The house is warm and inviting. Imagine drinking coffee on the deck and having a chipmunk come visit you in the morning. 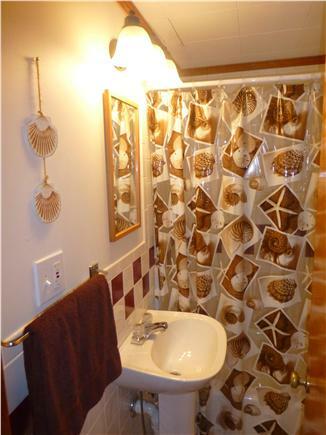 This home is a few houses back from the bay beach, so no need to drive, just grab a towel and chair and go! The home has a large wrap around deck for enjoying the outdoors or entertaining friends and family. 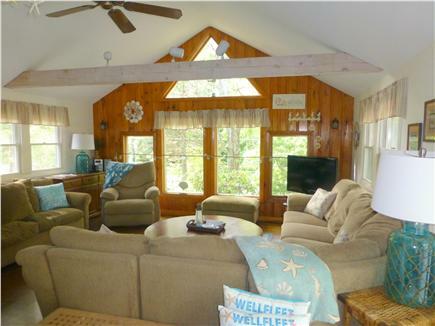 The indoors has a great family room with lots of beautiful windows shaded by the many oaks that surround the property. 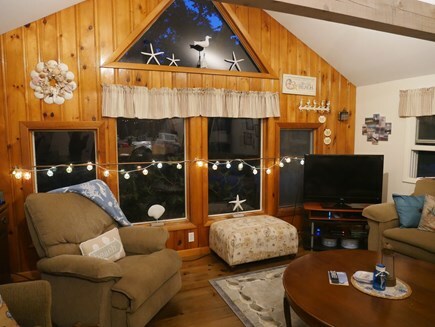 The dining area also has a small sitting area for separate spot away from the family room to enjoy a book, or a quiet conversation away from the kids.